It is associated with Valentine's Day. It is the setting for Caesar's refusal of the crown that was made immortal by Shakespeare, in his ​Julius Caesar. This is important in two ways: the association of Julius Caesar and the Lupercalia gives us some insight into the final months of Caesar's life as well as a look at the Roman holiday. The name of the Lupercalia was talked about a lot in the wake of the 2007 discovery of the legendary Lupercal cave —where, supposedly, the twins Romulus and Remus were suckled by a she-wolf. 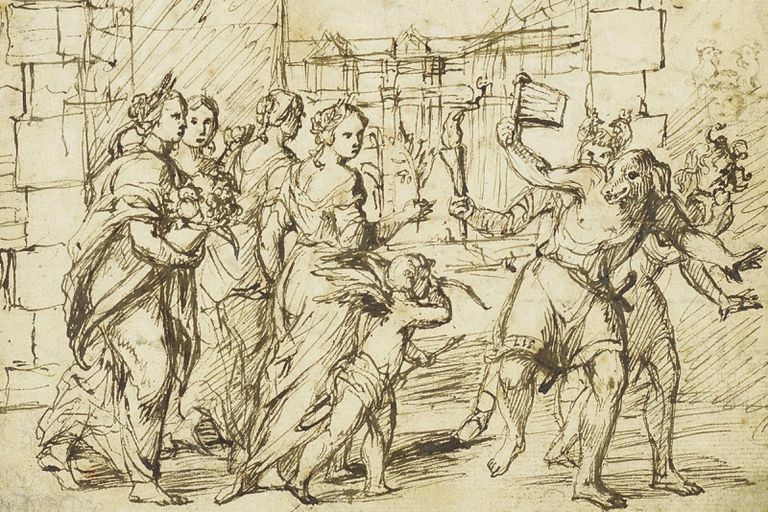 The Lupercalia may be the longest-lasting of the Roman pagan festivals. Some modern Christian festivals, like Christmas and Easter, took on elements of earlier pagan religions, but they are not essentially Roman, pagan holidays. Lupercalia may have started at the time of the founding of Rome (traditionally 753 B.C.) or even before. It ended about 1200 years later, at the end of the 5th century A.D., at least in the West, although it continued in the East for another few centuries. There may be many reasons why Lupercalia lasted so long, but most important must have been its wide appeal. Why Is Lupercalia Associated With Valentine's Day? If all you know about Lupercalia is that it was the background for Mark Antony to offer the crown to Caesar 3 times in Act I of Shakespeare's Julius Caesar, you probably wouldn't guess that Lupercalia was associated with Valentine's Day. Other than Lupercalia, the big calendar event in Shakespeare's tragedy is the Ides of March, March 15. Although scholars have argued that Shakespeare did not intend to portray Lupercalia as the day before the assassination, it sure sounds that way. Cicero points to the danger to the Republic that Caesar presented on this Lupercalia, according to J.A. North—a danger the assassins addressed on that Ides.
" It was also, to quote Cicero (Philippic I3): that day on which, sodden with wine, smothered with perfumes and naked (Antony) dared to urge the groaning people of Rome into slavery by offering Caesar the diadem that symbolized the kingship." Chronologically, Lupercalia was a full month before the Ides of March. Lupercalia was February 15 or February 13-15, a period either proximate to or covering modern Valentine's Day. Agnes Kirsopp Michaels says Lupercalia only goes back to the 5th century B.C. Tradition has the legendary twin brothers Romulus and Remus establishing the Lupercalia with 2 gentes, one for each brother. Each gens contributed members to the priestly college that performed the ceremonies, with Jupiter's priest, the flamen dialis, in charge, from at least the time of Augustus. The priestly college was called the Sodales Luperci and the priests were known as Luperci. The original 2 gentes were the Fabii, on behalf of Remus, and the Quinctilii, for Romulus. Anecdotally, the Fabii were almost annihilated, in 479. at Cremera (Veientine Wars) and the most famous member of the Quinctilii has the distinction of being the Roman leader at the disastrous battle at Teutoberg Forest (Varus and the Disaster at Teutoberg Wald). Later, Julius Caesar made a short-lived addition to the gentes who could serve as Luperci, the Julii. When Mark Antony ran as a Luperci in 44 B.C., it was the first time the Luperci Juliani had appeared at the Lupercalia and Antony was their leader. By September of the same year, Antony was complaining that the new group had been disbanded [J. A. North and Neil McLynn] . Although originally the Luperci had to be aristocrats, the Sodales Luperci came to include equestrians, and then, the lower classes. The cavorting Sodales Luperci performed an annual purification of the city in the month for purification -- February. Since early in Roman history March was the start of the New Year, the period of February was a time to get rid of the old and prepare for the new. The first was at the site where the twins Romulus and Remus were said to have been found being suckled by the she-wolf. This is the Lupercal. There, priests sacrificed a goat and a dog whose blood they smeared on the foreheads of the young men who would soon go prancing naked around the Palatine (or sacred way) -- aka the Luperci. The hide of the sacrificial animals was cut into strips for use as lashes by the Luperci after the necessary feasts and drinking. Following the feast, the second stage began, with the Luperci running around naked, joking, and hitting women with their goatskin thongs. Naked or scantily-clad festival celebrants, the Luperci probably ran about the area of the Palatine settlement. Cicero [Phil. 2.34, 43; 3.5; 13.15] is indignant at a nudus, unctus, ebrius 'naked, oiled, drunk' Antony serving as Lupercus. We don't know why the Luperci were naked. Plutarch says it was for speed. While running, the Luperci struck those men or women they encountered with goatskin thongs (or perhaps a lagobolon 'throwing stick' in the early years) following the opening event: a sacrifice of goat or goat and dog. If the Luperci, in their run, circled the Palatine Hill, it would have been impossible for Caesar, who was at the rostra, to have witnessed the entire proceedings from one spot. He could, however, have seen the climax. The naked Luperci started at the Lupercal, ran (wherever they ran, Palatine Hill or elsewhere), and ended at the Comitium. The running of the Luperci was a spectacle. Wiseman says Varro called the Luperci 'actors' (ludii). The first stone theater in Rome was to have overlooked the Lupercal. There is even a reference in Lactantius to the Luperci wearing dramatic masks. Speculation abounds as to the reason for the striking with the thongs or lagobola. Perhaps the Luperci struck men and women to sever any deadly influence they were under, as Michaels suggests. That they might be under such an influence has to do with the fact that one of the festivals to honor the dead, the Parentalia, occurred at about the same time. If the act was to ensure fertility, it could be that the striking of the women was to represent penetration. Wiseman says that obviously, the husbands wouldn't have wanted the Luperci actually copulating with their wives, but symbolic penetration, broken skin, made by a piece of a fertility symbol (goat), could be effective. Striking women is thought to have been a fertility measure, but there was also a decided sexual component. The women may have bared their backs to the thongs from the festival's inception. According to Wiseman (citing Suet. Aug.), after 276 B.C., young married women (matronae) were encouraged to bare their bodies. Augustus ruled out beardless young men from serving as Luperci because of their irresistibility, even though they were probably no longer naked. Some classical writers refer to the Luperci as wearing goatskin loincloths by the 1st century B.C. Goats are symbols of sexuality and fertility. Amalthea's goat horn brimming with milk became the cornucopia. One of the most lascivious of the gods was Pan/Faunus, represented as having horns and a caprine bottom half. Ovid (through whom we are chiefly familiar with the events of the Lupercalia) names him as the god of the Lupercalia. Before the run, the Luperci priests performed their sacrifices of goats or goats and dog, which Plutarch calls the enemy of the wolf. This leads to another of the problems scholars discuss, the fact that the flamen dialis was present at the Lupercalia (Ovid Fasti 2. 267-452) in the time of Augustus. This priest of Jupiter was forbidden to touch a dog or goat and may have been forbidden even to look at a dog. Holleman suggests that Augustus added the presence of the flamen dialis to a ceremony at which he had earlier been absent. Another Augustan innovation may have been the goatskin on previously naked Luperci, which would have been part of an attempt to make the ceremony decent. By the second century A.D. some of the elements of sexuality had been removed from the Lupercalia. Fully dressed matrons stretched out their hands to be whipped. Later, the representations show women humiliated by flagellation at the hands of men fully dressed and no longer running about. Self-flagellation was part of the rites of Cybele on the 'day of blood' dies sanguinis (March 16). Roman flagellation could be fatal. Horace (Sat., I, iii) writes about horribile flagellum, but the whip so used may have been a rougher sort. Scourging became a common practice in the monastic communities. It would seem likely, and we think Wiseman agrees (p. 17) , that with the early church's attitudes towards women and mortification of the flesh, Lupercalia fit right in despite its association with a pagan deity. In "The God of the Lupercalia", T. P. Wiseman suggests a variety of related gods may have been the god of the Lupercalia. As mentioned above, Ovid counted Faunus as the god of the Lupercalia. For Livy, it was Inuus. Other possibilities include Mars, Juno, Pan, Lupercus, Lycaeus, Bacchus, and Februus. The god itself was less important than the festival. Sacrifice, which was a part of Roman ritual, had been prohibited since A.D. 341, but the Lupercalia survived beyond this date. Generally, the end of the Lupercalia festival is attributed to Pope Gelasius (494-496). Wiseman believes it was another late 5th century pope, Felix III. The ritual had become important to the civic life of Rome and was believed to help prevent pestilence, but as the pope charged, it was no longer being performed in the proper manner. Instead of the noble families running around naked (or in a loincloth), riffraff was running around clothed. The pope also mentioned that it was more a fertility festival than a purification rite and there was pestilence even when the ritual was performed. The pope's lengthy document seems to have put an end to the celebration of Lupercalia in Rome, but in Constantinople, again, according to Wiseman, the festival continued to the tenth century. "Caesar at the Lupercalia," by J. A. North; The Journal of Roman Studies, Vol. 98 (2008), pp. 144-160. "An Enigmatic Function of the Flamen Dialis (Ovid, Fast., 2.282) and the Augustan Reform," by A. W. J. Holleman. Numen, Vol. 20, Fasc. 3. (Dec., 1973), pp. 222-228. "The God of the Lupercal," by T. P. Wiseman. The Journal of Roman Studies, Vol. 85. (1995), pp. 1-22. "Postscript to the Lupercalia: From Caesar to Andromachus," by J. A. North and Neil McLynn; The Journal of Roman Studies, Vol. 98 (2008), pp. 176-181. "Some Notes on the Lupercalia," by E. Sachs. The American Journal of Philology, Vol. 84, No. 3. (Jul., 1963), pp. 266-279. "The Topography and Interpretation of the Lupercalia," by Agnes Kirsopp Michels. Transactions and Proceedings of the American Philological Association, Vol. 84. (1953), pp. 35-59. "The Lupercalia in the Fifth Century," by William M. Green. Classical Philology, Vol. 26, No. 1. (Jan., 1931), pp. 60-69.